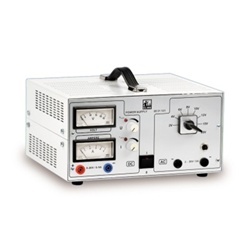 Power supply with adjustable and stabilized DC voltage and analog voltage and current display for DC voltage. The DC voltage component features an automatically alternating voltage and current control and is protected against continuous short circuits. The AC voltage can be selected in eight steps, the output is protected by an over-current circuit breaker. The AC and DC voltage outputs are DC isolated. A temperature regulated fan protects the unit from overheating.